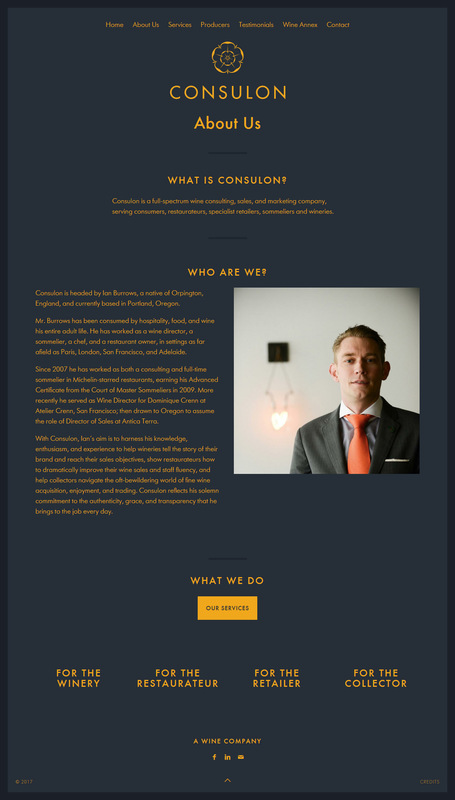 The concept of Consulon was realized in 2015 by advanced certified sommelier and entrepreneur Ian Burrows. Based from offices in Portland and Newberg, OR, Consulon offers bespoke services ranging from fine wine brokerage to cellar appraisals and consultancy for small wineries, restaurants, specialist retailers, and private collectors. Establish a brand identity for Consulon that is elegant, modern, and old world, with a dark palette and an aspect of mystery. 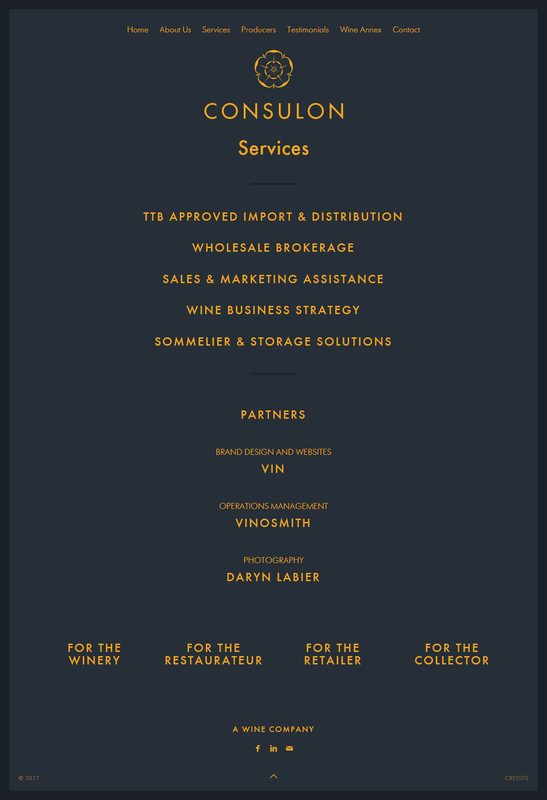 Allow flexibility for a range of services including brokerage distribution, marketing, sommelier consultancy, and a sibling fine wine brand AEREA. Keep in mind touchstones descriptors including forward-thinking, open-minded, European, non-conformist, and approachable. Appeal to an audience of educated and knowledgeable boutique wineries, private clients cellars, wine professionals, and savvy business people who are open to investing in growth. 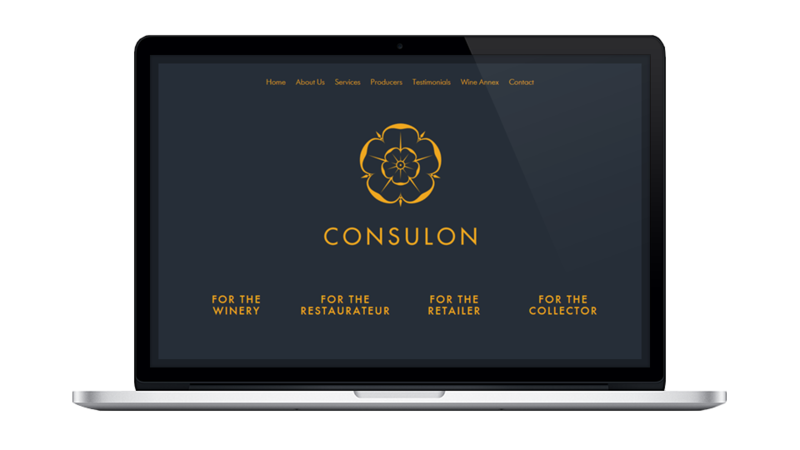 Consulon required a varied array of design input to realize its vision of branding, icon design, and a fully functioning website to enter the fine wine brokerage arena. Jon Krauss came highly recommended to us by one of his previous clients, and after a brief telephone conversation we knew we had found a kindred spirit in Vin. Jon’s prior experience and focus, coupled with an almost maniacal attention to detail, ensures ‘no design stone is left unturned’. Goals were set throughout the design process and were attained to ensure that final production was not only flawless in quality but delivered on-schedule. Vin has recently joined as part of Consulon’s preferred service advisors for its professional network.